Step #1 Adjust the Nylon Tuner. A. Back Off the Nylon Tuner for that string. B. Back Off the 10-32 Travel Adjustment screw on the crossbar. Down towards the botton of the picture you will see the 10-32 Travel screw that allows for you to adjust how much travel there is in the crossbar. 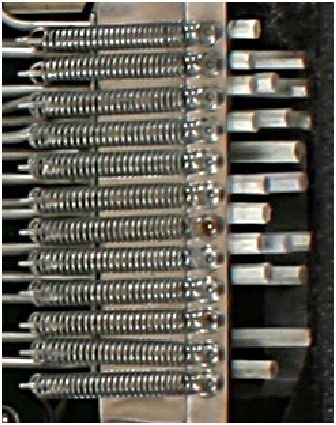 Check the springs on the tone changer. If while raising the pitch of the string, the spring pulls away from stop ( flat metal piece under the spring) Adjust spring tension by cutting out link and re-bend. 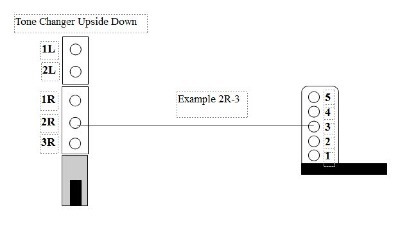 The reason for this is because there is not enough tension to hold the tone changer back against the stop. The tone changer must touch the stop. If you can’t do this, springs are available from the Factory. 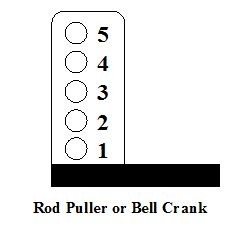 Sometimes when changes are made to your copedant, pull-rods can be placed in the wrong positions on the rod pullers or bell cranks as referred to by some companies. When this happens, you can experience stiffness in the pedals and or knees’ action, as well as, detuning because there is not the proper amount of travel. 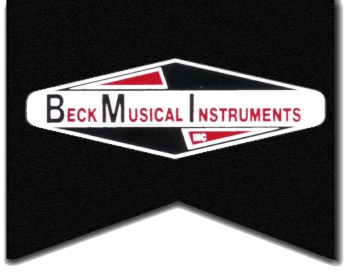 At Beck Musical Instruments we strive to serve the pedal steel community and our customers with honesty, integrity and solid, hand built, quality instruments. Contact Us with any questions, comments, concerns or to place your order.